Who's damn car was it? Shall we put our collective noggins together and discuss? When was it again that Parent gave Garretson the FIRST ride? I don't have any of the books or artifacts anymore to reference. I had a friend who, back in 1990, got an old dodge dart, white, and fixed it up. I had another friend a few years later who had a white Rambler. He bragged to me the first time he showed it to me, "The only other car like this was the one in the Manson murders." He didn't know I was into the case. So I got a close up experience with a car identical to Parent's - he even took me for a ride in it. They do look similar, the two cars, from slightly afar, the Rambler and the Dart. Hardly identical. So, were Garretson and Parent "having relations"? I've always wondered about that. Not that it has any relevance to the case. Or does it? I have read "rumors" about Garretson being a "houseboy" to Mr. Altobelli, but do not know if that is true. I have never heard about Parent, and Garretson, however. Although...I did read in some of the police reports that Parent had a criminal record for theft, or breaking/entering. He had been sent to juvenile hall for it too. He had stolen some electronics. That doesn't have anything to do with the other subject, but hell, maybe it does! This whole thing could probably be explained a helluva lot better if Garretson would be truthful for ONCE! His story has NEVER made much sense. There are so many questions concerning Garretson. At any rate, I wonder who's car that was that Wednesday morning at 4:30 AM? Weird! Unfortunately we can't believe anything Garretson says these days because it's obvious that he suffers from grave mental illness. It is soooo difficult to get up those tiny little Beverly Hills streets to get to 10050. ANY car that was outside the gate there may be significant: what other reason would there be to go up that way unless you lived there or had business there? AustinAnn, this is a very interesting question. I never believed that Steven was gay, but if that was his car then he was likely visiting Billy regularly, or at least more than that one time. Why did CM "order" everyone in the main house - but NOT the guest house - to be killed? IF CM really did return to the Tate house that night did he NOT at least check on the guest house? As for the PIC, when was it taken? There are at least 2 other cars in PIC. Hi Matt, I think the other two cars are Folger's Firebird and Sebring's Porsche. Something else Matt, I'm thinking Charlie did check the guest house. Garretson said that the door knob was turned and Krenwinkle denies going all the way to the guest house. Maybe Charlie or whoever he was with tried to open the door. @Max, what did you do with all your books? Patty lost her daddy's Helter Skelter many year ago, but Mom Patty just replaced it with a 22c thrift store copy. The benefits of being "out" with her. Speaking of being out: @Suze: being flexible must come in handy while being flexible, no? Sorry, Patty could not resist. @Doc: how's the weather up there? Supposed to be over 100 all week here "in Ballarat." @Heidi, do you really work for Glock? Hi Patty, it's supposed to be pretty hot. How hot, I'm not sure. I have to go to Carson City, NV today and I'm pretty sure it will be in the 100s. I was under the impression that at some point Garretson admitted that he went outside and hid during the murders and that Katie said they checked the guest house and no one was in it? So many different sources, stories etc. Who to believe? I think I saw that story about Garretson hiding too. Didn't he come up with it rarher recently? Yes, I think his story has changed a lot. He seems like someone who knows more than he lets on. Weird dude too. Maybe that was the interview he gave in the 90s? When people change their story, it makes me wonder which time they were lying. Patty, I haven't had most of those books for several years. Either sold 'em, lost 'em, or loaned 'em and never got 'em back. One things is for sure regarding the guesthouse: Krenwinkle was lying when she told Dianne Sawyer in '94 that she was on her way to the guesthouse but suddenly changed her mind due to a moment of clarity. Max Frost, in my opinion is completely right about Pat and the guesthouse. Garretson knew her, I think. I also think she saw Garretson that night, and told him to hide. He's been scared shitless, and witless ever since. Too many lies and inconsistencies to name, that's for sure. I have always wondered what was in that little office space up above the garage (white exterior staircase shown in the photo). Are there any photos out there of the inside of that room? I've seen photos of everything else on that property. When Sharon offered her housekeeper the option of sleeping over at Cielo during the heatwave, I wondered where Mrs. Chapman would have slept---up in that office? Cielo was actually not such a huge house, and the bedrooms were occupied. The nursery had wet paint, and I may be wrong but I do not believe it had a bed in it anyway. The living room loft would have been too hot for an adult guest to be comfortable on a hot night, but I read that Sharon's sisters had enjoyed sleeping up there before the heatwave. I have never seen air conditioning units, but have not seen many photos of the back windows where they might have been installed. Air conditioning was not commonplace in every home in LA at that time. Maybe the office had a bed and was offered to Mrs. Chapman. This little detail----where would she have slept?---has puzzled me since I first read that Mrs. Chapman could have slept over that night. 1. Garretson is obviously damaged, for whatever reason. Even aside from that, he has always set off my BS alarm. I've always wondered what he really knows. 2. I don't know about Garretson, but Altobelli has always set off my gaydar. Also, he's a jerk, IMHO. She could've slept in the 3rd bedroom. Didn't they have air mattresses then? Rudi was cool. VERY clever guy. Rudy was not cool at all. After the murders he sent a bill to Sharon's dad for damages done to the house during the murder. As far as Garretson goes, I heard his new story is that someone came and handed him a baby to hold after the murders. He believes that Sharon's baby is still alive. The car outside the gate. Might have been Tex up checking the place out before he "hit" it. Jimmy, that might have been a possibility, but, for some reason I keep thinking it might of been Steve Parent's car at the gate. Too much of a coincidence that a white rambler would of been at the gate just 2 nights before the murder. I could very well be wrong, though. Does Steve's car have black or white walled tyre's ? 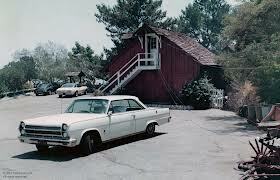 In the photos of the ranch can anyone spot a white dodge or rambler type of car ? The Johnny Shwartz car that Tex drove on the night of the murders kind of resembles the Rambler. jenn your gaydar is right on, altobelli was a gay man, who liked to pick-up guys on the sunset strip, that's where he found garrettson after all. I've wondered if that was SP parked outside the gate early that Wednesday. So why would SP be there? My first thought was that he was hooking up with Billy G. Second thought was maybe SP was doing his own creepy crawling around the property, trying to get a glimpse of the girls in the house? Or third, perhaps there is a drug connection and SP was a delivery connection...perhaps he was partaking with Voytek and/or Jay? Hatami testified that in March of 69 when Manson came to the Cielo house front door, looking for Melcher, HE told Manson "This is not the place. The people you want is back there (points to guest house) and you have to take the back alley" (a dirt path). So was the main house only for the "beautiful people" and the guest house was where the riffraff were supposed to go? Think he might have been referring to Garettson? Good morning Matt. Good question, I'm not sure if Hatami meant Garretson or Altobelli or how many times Hatami was on the premises. The guesthouse had a reputation of where the "kids" stayed...Billy Garretson, Darrel Kistler, Patty Maloney? and Debbie Tidwell. Does anyone have any links or ideas as to what happened to all the cars involved? I know that Johnny's '59 Ford is in the LAPD Archives, and Jay's Porsche is at the Sebring Corporate HQ in Albuquerque, NM. But what about The Fire bird, Camaro, Sharon's Ferrari, The Rambler, and the La Bianca's T Birds/boat. Yes, it would help if we knew if SP's car had the same kind of tires. The Ford they used had white wall and Steve's car had black wall, just like the one outside the gate on Wednesday morning. Parent's car was returned to his parents. I remember reading that it was returned without being cleaned, so covered in fingerprint dusting powder and bloodstains. How horrible! They returned the car to Steve's parents without cleaning the blood? They didn't show too much compassion for them. Ain't nothing changed since then, sure enough! Yeah, didn't they also let Mr. Parent know his son was dead by giving him a business card with a number to call on it? That is so cold! You guys have to if you haven't checked out Dave McGowan's "Inside the LC" series of posts. I am not McGowan nor do I work for him but his site is titled Center for an Informed America. It has shed a lot of light about the connections of the scene in LA from the mid 60's to the military industrial complex,,and yes indeed he goes into great detail connecting a whole lot of extremely weird goings on from the Manson family as well.